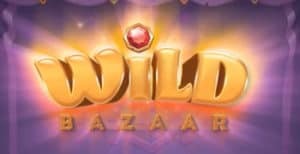 Wild Bazaar Slot | The most Wild-featured NetEnt game ever! Step into the Wild Bazaar slot, a new entertaining online casino game from NetEnt. Wilds are, obviously, in focus and if you are looking for a colourful slot packed with wins – this is it. In the heart of a Marocco-like world, a big market, bazaar, are the background of this game. We could smell get the oriental scents once we started to try it out on the classic NetEnt platform that we all have gotten used playing at. As always with NetEnt games, it works just as well playing on our phone or tablet as the laptop. You will find it on most of all new casinos in the UK. Now, say hello to the Wild Bazaar with its colossal wilds, stacked wilds and much more! By now, y0u understand that these are the symbols you want to get in this game. To get the really big wins, there are ways to get two or more of these features at the same time. Except for this, there are some pieces of jewellery that will give you the “standard wins”. However, they won’t give you that much. So, start your hunt for the chests straight away to get the most out of this game. So, what differs this game from many other of the games from this provider? Well, we have never seen such a wild-focused game from NetEnt ever before. Sure, many times there are different features of wilds that make the game much more fun. In this game, it probably is the only feature that will make the game fun. So, if you are a sucker for wilds in general, you should really try this out. If you are looking for a wider variety of features, you might get bored of Wild Bazaar slot quite fast. See all our slot review here!